A second meeting with top Democrats ended with no resolution to the standoff. 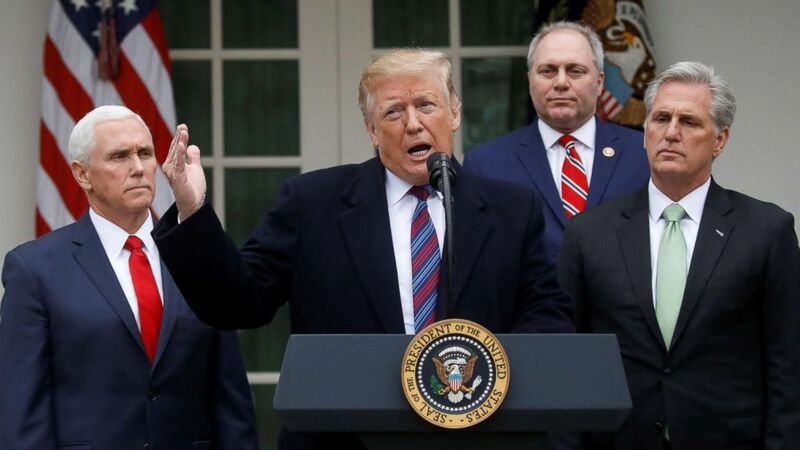 President Donald Trump said Friday he would keep the government shut down for months or even a year or longer if needed to get his way on border security and said he has considered declaring a national emergency to try to secure funding for a wall on the U.S.-Mexico border. "Yes, I have. And I can do it," Trump said in the White House Rose Garden, answering a question from ABC News' Senior National Correspondent Terry Moran. He added he could do so "for the national security of our country." The president's remarks came after an ABC News report that he was seriously considering potential options to circumvent Congress, including declaring a national emergency, to reprogram funds from the Department of Defense and elsewhere to help pay for parts of his desired border wall, according to multiple sources familiar with the ongoing discussions. Earlier, Trump had said he had had a "productive" and "very, very good meeting" after talks with top Democrats and other congressional leaders at the White House Friday in an effort to end the partial government shutdown now heading into the third week. During the hastily-arranged Rose Garden press conference with DHS Secretary Kirstjen Nielsen, House Minority Leader Kevin McCarthy, House Minority Whip Steve Scalise, and Vice President Mike Pence standing at his side in the cold, Trump said staff-level talks would continue over the weekend and expressed optimism about a resolution to the standoff over the president's demand that Democrats pass a measure to pay for the wall he wants. Pence, Nielsen, and presidential adviser Jared Kushner will be leading a White House delegation for negotiations, at the direction of the president. "We put together a team of people that will work over the weekend and they'll be negotiating on the border. On the look, on different things having to do with border security and including at the ports of entry," Trump said. "And I think they'll be very successful. Because I found the Democrats really want to do something." Just minutes earlier, Senate Democratic Leader Chuck Schumer told reporters outside the White House that Trump told lawmakers in their nearly hour-and-a-half meeting that he is prepared to keep the government closed "for a very long period of time, months or even years." 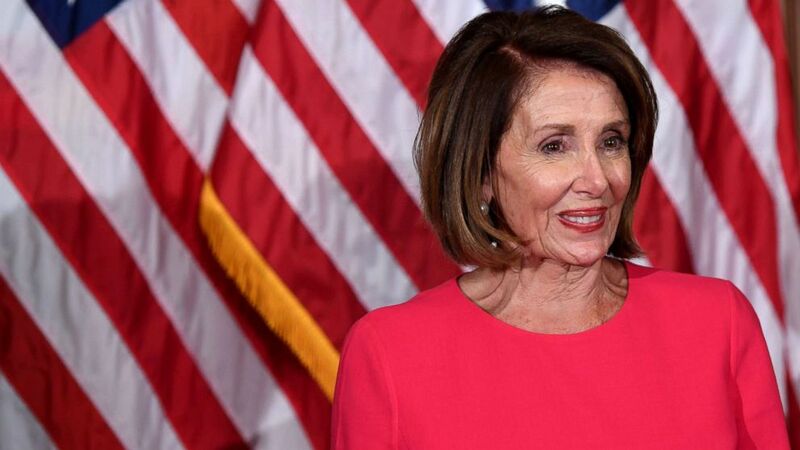 House Speaker Nancy Pelosi called the meeting "contentious." Trump, answering a reporter's question about Schumer's remarks, confirmed that he made the threat and agreed that the meeting had been "contentious" despite his earlier upbeat tone. A person familiar with the meeting who spoke to ABC News on the condition of anonymity said that there was a lot of yelling across the table at the meeting and that the president opened the meeting by insisting that his $5.6 billion request was the number he intended to stick to. His statement, according to this person, was met with Democrat frustration. Discussions between the president and Democratic leaders had a bumpy start weeks ago, with Trump declaring he would "own" the government shutdown. When reminded of his comments Friday, he said: "I'm very proud of doing what I'm doing." "I don't call it a shutdown. I call it what you have to do for the benefit and for the safety of our country," Trump said. Schumer said during the meeting on Friday that Trump resisted Democratic pleas to reopen the government as discussions continue. "The bottom line is very simple. We made a plea to the president once again. Don't hold millions of Americans hundreds of thousands of workers hostage. Open up the government and let's continue the discussions," Schumer said. "How do you define progress when you have a better understanding of each other's position? When you eliminate some possibilities?" Pelosi said. "If that's a judgment, then yes, we made progress," she said before turning on her heels with Democrats to leave the White House. Friday's meeting largely mirrored a Situation Room briefing on border security Wednesday with the same eight members of leadership for both parties in the House and Senate. Friday's briefing took place in the Situation Room and was not open to press coverage. The meeting also came after the House and Senate adjourned Friday morning. The two chambers are set to return next Tuesday, all but assuring that the partial government shutdown will likely continue well into next week. (Carlos Barria/Reuters) President Donald Trump speaks with reporters following a meeting with congressional leadership on the ongoing partial government shutdown in the Rose Garden of the White House in Washington, Jan. 4, 2019. Fresh off her election as House Speaker, Nancy Pelosi was expected to pressure the president to sign a series of measures House Democrats passed Thursday evening that would open the six federal agencies shuttered in the government shutdown and extend Department of Homeland Security funding through Feb. 8 to make time for negotiations on border security. Senate Majority Leader Mitch McConnell has said he would not bring the bills for a vote in his chamber without approval from the president, who has only dug in on his demands for more than $5 billion in funding for a wall along the U.S.-Mexico border. "The package presented by the House's new Democratic leaders yesterday can only be seen as a time-wasting act of political posturing," McConnell announced on the Senate floor Friday morning. He went on: "It does not carry the support of the president ... the president would actually veto it. And it cannot earn the support of 60 of my colleagues over here in the Senate. My friends across the aisle understand the ground rules perfectly well." But there were new signs of cracks in the GOP line as Republican members awaited word from the White House on what exactly the president might sign that would satisfy a sufficient number of Democrats to pass out of the Senate, where a 60-vote threshold is required. Sen. Cory Gardner, R-Colo., and Sen. Susan Collins, R-Maine, both said they would support measures that would end the partial shutdown and not provide the funding demanded by the president for his border wall. Reacting to Gardner and Collins' statements, press secretary Sarah Sanders told reporters Friday the president wouldn't back down. "Look the president has the support of the American people because they want to feel safe," Sanders said. "The number one duty that the president has and frankly that Congress shares with him is to protect the people in this country." Both sides made no progress in the Wednesday meeting as President Trump and DHS Secretary Kirstjen Nielsen sought to exclusively focus on the need for a wall, which Democrats have described as unnecessary and "immoral" in the broader argument for enhanced border security.